The movie DEATH DO US PART (in which Aaron has a cameo role as a Ranger) is airing on the Super Channel in Canada at the end of this month and in November. The movie DEATH DO US PART (in which Aaron has a co-starring role as a Ranger) is out on DVD today (April 15th). It is also available to purchase on iTunes and Amazon instant video. Links on where you can purchase it are below. And of course you can pick it up and the usual places (Wal-Mart, Target, Best Buy, etc). UPDATE: If you’re in the USA it’s cheaper at Best Buy. Their website lists the price as USD $9.99. DEATH DO US PART: is finally being released!!! Everyone remembers the movie DEATH DO US PART that Aaron filmed back in December 2011, right? :) It is finally going to be released. It will be available On Demand on April 4, 2014 and out on DVD on April 15, 2004. They are also planning on screening the movie at the RIO THEATRE in Vancouver on April 6th at 7pm. Not sure if Aaron will be able to make it but I’ll keep you posted. Bloody Disgusting has the exclusive trailer premiere which you can watch below. UPDATE: Here is the same trailer on YouTube. Here are the links to pre-order DEATH DO US PART on DVD at Amazon. Below is the trailer for the movie DEATH DO US PART that Aaron has a cameo in. Aaron is on screen at the 00:07 – 00:09 time stamp. It’s the same scene we’ve scene before HERE and HERE. 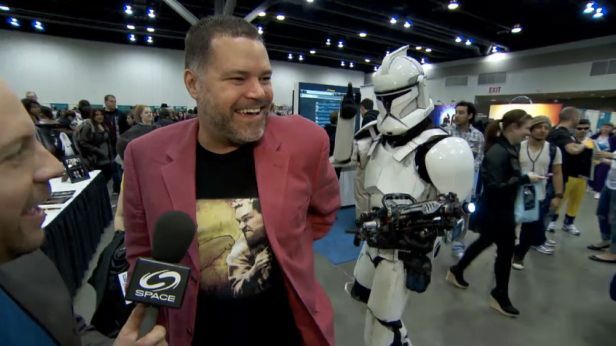 Here are a couple of videos of Aaron from Fan Expo Vancouver 2012. Spring is upon us and so is wedding season! But if you’re not quite ready to commit to marriage, we suggest at least committing to seeing the new horror film “Death Do Us Part”! We met up with some of the cast and crew at Vancouver Fan Expo where they gushed about the genre names attached to the project – and gave us a warning about the dangers of throwing a joint stag party! Aaron is on screen at 0:05 – 0:11 (snippet of a scene from the movie) and at 0:41 – 0:45 (same scene). From the extraterrestrial to the extraordinary… the first ever Fan Expo Vancouver was held this past weekend, and Teddy, Cynthia and Ajay flew out to meet the fans and have a great time! Aaron is on screen at 01:05. Blink-and-miss-it. Below is a photo of Aaron at Fan Expo Vancouver 2012 on Saturday to promote the movie DEATH DO US PART. Ignoring the ghastly red linen jacket, I think he looks really great. There are some more photos of Aaron from the con on the facebook fanpage HERE. Below is a video interview with the director and two of the stars of the movie DEATH DO US PART in which Aaron has a cameo. There are some clips from the movie shown throughout the video. You can see Aaron at the 01:59 time stamp (screen cap below). Sorry, there was no option to embed the video. Briana catches up with the director and stars of the indie horror movie Death Do Us Part. Just a reminder that Aaron is scheduled to appear at the following convention in CANADA this weekend to help promote the movie he has a cameo in, DEATH DO US PART. Below is the UPDATE on Aaron’s appearance at the con. Some things that are in the schedule are incorrect. Aaron will be part of the DEATH DO US PART panel on Saturday at 12 noon in room 109 (located on the ground level). The schedule has Aaron listed as doing Photo Ops with Michael Hogan at 2:30pm on Saturday and at 12noon on Sunday. Michael Hogan has CANCELLED his appearance at the con. We are assuming that Aaron will be doing a solo photo session at these same times. But double check this when you get to the con. (UPDATE: Just had it confirmed that Aaron will be doing photos at those same times). Aaron will be signing at booth #235 along with the cast and crew from DEATH DO US PART. The schedule has him listed as being in the ELECTRIC PLAYGROUND booth (#336), this is incorrect. The below is a screen cap from the Fan Expo website. It reads that signing is at 1pm. But they will be in the booth from 10am. As mention previously (HERE), Aaron has a cameo in the feature film DEATH DO US PART playing the character Harry. Aaron is filming his scenes tomorrow (Saturday Dec 17, 2011) in Vancouver, fingers crossed that we get some photos. Aaron has a cameo in the feature film DEATH DO US PART as the character Harry. Aaron doesn’t actually know anymore than that as he is appearing in the film as favour to his friends Peter and Julie Benson who are the Writers and Executive Producers of the film. Hopefully once he’s filmed his scenes he can give us some more info, unless of course it contains spoilers. Movie Synopsis: Kennedy Jamieson, a wealthy socialite, has waited her whole life to have the perfect wedding. Engaged to the charming Ryan Harris, the young couple is just a week away from the big day but hasn’t had a chance to celebrate their respective bachelor/bachelorette parties. 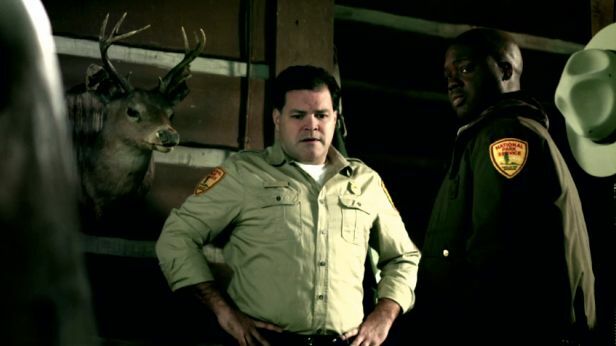 Ryan’s best man Chet books a remote cabin in the woods to throw them a ‘Jack and Jill’ stag that they’ll never forget. Out in the middle of nowhere, things take a horrifying turn as members of the group are brutally picked off one by one. What started out as a celebration quickly descends into a bloody nightmare. Friendships are ripped apart and accusations fly in this blood filled psychological horror with a whodunit twist. Cast: Julia Benson (Kennedy), Peter Benson (Ryan), Christine Chatelain (Hannah), Emilie Ullerup (Emily), Kyle Cassie (Chet), Ben Ayres (Derrick), Dave Collette (Bo), Aaron Douglas (Harry).